Book Mark & Marlo for your next event! Call now for availability - 330.474.9596 or 415.797.7479. Creating opportunities doesn't have to be rocket science...but being focused in your efforts can lead to success far faster than just finding things to keep yourself "busy". My wife suggested going for a Guinness World Record. It's a huge brand with universal recognition, and if nothing else it'd be a great addition to the ol' resume. You can read about the actual attempt here. My name is Pia, working for the China Central Television which is the biggest TV station in China. My team has produced a TV show named Guinness World Records China Specials for 9 years. And now, the new season is under preparation, which will be filmed in Fujiang Province, Mainland China between 3rd to 10th. By the way, this season is planned specially for the 60th Anniversary of GWR. Fujiang province? Where's that? Google mapped it, and I see that it's on the West bank of the Taiwan Strait. Taiwan...that's tropical, right? I'm in!! China Central TV was offering two round-trip tickets for Marlo and myself, spending cash, and (of course) the chance to defend my title on a HUGE stage - what's not to love about this deal? What do I know about China? China - it's a mystery for many Westerners, who often don't know more than what they are taught in their 10th-grade history classes. I was no different. I recalled pieces of information about the cultural revolution led by Marxist-Leninist Mao Zedong, a giant wall erected to protect the country from invading hordes to the north, and the fact that Szechuan is a province...not just a menu descriptor. We Americans are so accustomed to viewing Chinese-U.S. relations as an us-versus-them affair, and I was eager to see firsthand whether the perception would hold up after setting foot on the most populous nation on earth. So firstly, if you've never taken a 13 hour flight - let me congratulate you. Those things are brutal. Especially when your flight gets delayed 2 hours, making you miss your Beijing connection, and they put you up in a hotel room that is more like a holding cell (it was 8'x8' and windowless, fer Pete's sake). So after waking up after a 4 hour nap in the "Beijing Sleeping Cube", we finally get on our connecting flight to Xiamen, Fujian Province (which was mercifully uneventful), and step off the plane into a freaking sauna. The fact that it was September meant that summer was far from over in this subtropical part of China, and it made us want to get to our hotel ASAP. But once we got there....ah...paradise. Just look at it! 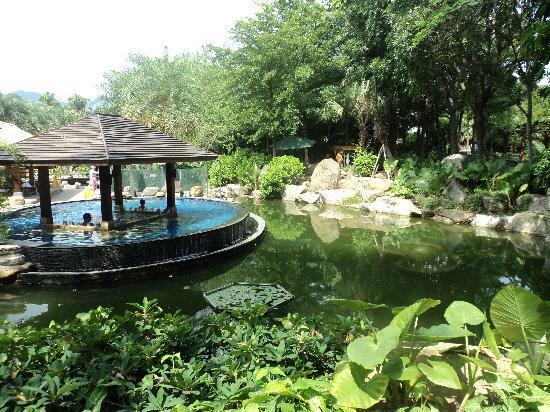 And that was only one of over 30 pools to choose from at Xiamen's Riyuegu Hot Springs Park. Some were scented, some had little fish that nibbled on your skin...some were even electrified. What a wonderful way to unwind after flying halfway around the world. All for about 100 bucks - not bad! After soaking for around 4 hours, it was time to sleep so we could minimize the ever-dreaded jetlag. Stay tuned for the report of the on-air competition in part 2.